WHEN In the fall of 2012 Movehome as a brand was released on movehome.se. When the home building brand Movehome was about to be released, a simple webpage just wasn’t enough. Movehome wanted something bigger, a unique experience making the planning of your new house both easier and more enjoyable – letting you see the house of your dreams before it even existed. Out of this we created Bygg Online, a configurator available on movehome.se where users are given the possibility to customize their dream house piece by piece – choose textures, appliances, colours and much more. And to top it all of, your masterpiece is then visualized in full 3D splendor – helping both you and the people around you understand your future home. 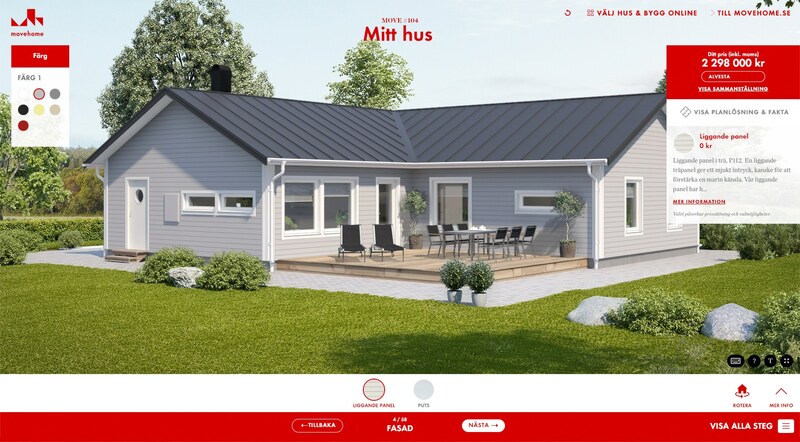 With no hidden fees or secrets at all – the cost of building your house is presented in real time down to the single krona while you’re working on it. The online service Bygg Online is a breeze to use, giving you full control over both specification of and cost for your house, that way making it the easiest way to come to a decision on your future house. Lots and lots of different options to work with combined with smart visual aids, let you as a potential customer have full control over the process. 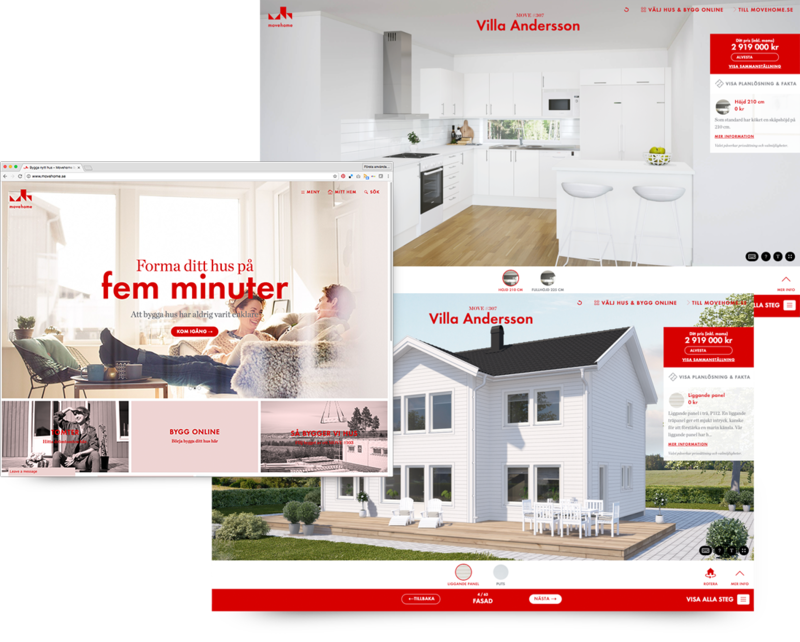 And as Bygg Online is web based and available 24/7, wherever and whenever you want to work on your house, you have the possibility to do so. Finished houses are available for viewing, making it super simple to share your creations in social media or through other channels. The solutions has also proved to be a great success for Movehome’s business. In addition to providing an inspiring and innovative service to many users, it is also a powerful sales tool in that it makes the process both faster and more efficient. When a user gets in touch with Movehome’s sales people, they have already done 80% of the work and is more or less fully ready to sign the contract. Saving both time and energy, leaving room for upselling and other “bonus” initiatives. And in order to make the service “democratic” and available to all, regardless of how you access it, we built it in HTML – making it completely platform independent. The solution was upon release the first of its kind and went on to become an industry leader with copies from other players to follow. It has shortened the lead time for configuring and selling with some 90% and is today an extremely vital and important player in the industry. To a great extent, it is also to be considered an e-commerce solution as Movehome commit themselves to a contractually binding price for 30 days – if we now only could solve a payment solution allowing for sums around 2-3 MSEK, it would truly be an “add-to-basket” experience. And from a user perspective, more than 60% of the visitors to movehome.se, are accessing the Bygg Online service via a mobile device and one in four complete a configuration while online – proving that innovation combined with great user insight and with focus on simplicity and ease of use, provides the strongest of solutions. And if any, Bygg Online is the perfect example of the relationship Milou so strongly believe in – the one between Business, Design and Technology.